the dome. 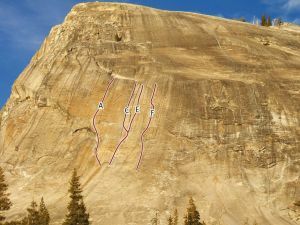 Awkward, strange, weird, and runout, it’s one of the few routes where many people deliberately use their knees. It’s possible to start up the right crack then make a big step left to the left crack, or you can start low in the left crack. A couple bolts can be clipped either from the left or right cracks. Which SuperTopo guidebooks include a topo for Left Water Crack?